A gazebo will enhance any landscaping. It provides shade and a meeting place. Gazebos are available in kit form or you can design your own or modify another set of plans. Gazebos are sometimes known as pavilions. Most of the gazebo and pavilion projects can be accomplished by an intermediate level woodworker or handyman. Selection of manufactured gazebos in kit form . The Western Red Cedar Lumber Association provides design drawings for this gazebo and spa cover. The Western Red Cedar Lumber Association provides design drawings for this very basic square gazebo frame. The Western Red Cedar Lumber Association provides design drawings for this very basic octagon gazebo frame. From the state of Florida detailed plans for a 26' x 38' picnic pavilion. These plans can be easily reworked to make a smaller pavilion. The Western Red Cedar Lumber Association provides design drawings for a octagon gazebo that is designed for shade. The Western Red Cedar Lumber Association provides design drawings for a square framed gazebo/pavilion with roof. The Western Red Cedar Lumber Association provides design drawings for an octagon gazebo with railings and roof. 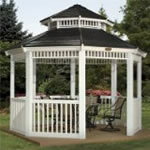 The Western Red Cedar Lumber Association provides design drawings for an oriental style gazebo..